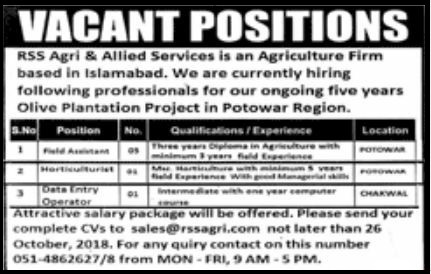 RSS Agriculture & Allied Services (Pvt) Limited Islamabad. RSS Agriculture & Allied Services is an agriculture firm based in Islamabad. we are currently hiring following professionals for our ongoing five years Olive Plantation Project in Potohar Region. Please send your complete CVs to sales@rssagri.com not later than October 26, 2018. For any query contact on this number 051-4862627-8 from Mon - Fri, 9 AM -5 PM.